The latest addition to the SSDNow V300 series offers almost 1 TB of storage space and excellent performance and reliability - 1 million hours MTBF. Kingston announced earlier today the latest member of the SSDNow V300 family of solid state drives, the V310. According to the official press release, this drive has a generous capacity of 960 GB and "dramatically boosts system responsiveness" when compared to a 7200 RPM hard disk drive. This drive is covered by Kingston's 3-year warranty with free technical support and is available "as a stand-alone drive or as all-in-one kits that include all the accessories needed plus software to clone files and OS to make for an easy install." Pricing and availability depend on the area and have not been announced yet. For more details, please check the press release below. Kingston Digital Europe Co LLP, an affiliate of Kingston Technology Company Inc., the independent world leader in memory products, today announced its latest addition to the SSDNow V300 series, the V310. 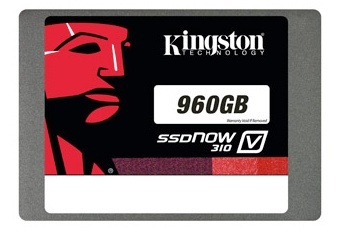 The Kingston® SSDNow V310 solid-state drive dramatically boosts system responsiveness while also offering 960GB capacity to store all movies, music, games, files and applications. The new SSDNow V310 is 10x faster than a 7200RPM hard-disk drive1 as a result of the Phison 3108 controller and 450MB/s read and write speeds2. With no moving mechanical parts, SSDNow V310 is shock-proof, uses less energy and stays cool making it more reliable and less likely to fail than standard hard-disk drives. The large capacity of the SSDNow V310 allows enough space for a true HDD replacement so users can migrate their entire hard drive over with storage to spare. SSDNow V310 is available in 960GB as a stand-alone drive or as all-in-one kits that include all the accessories needed plus software to clone files and OS to make for an easy install. SSDNow V310 is backed by a three-year warranty, free technical support and legendary Kingston reliability. 4 Based on “out-of-box performance” using a SATA Rev. 3.0 motherboard. Speed may vary due to host hardware, software, and usage. 6 Total Bytes Written (TBW) refers to how much total data can be written to an SSD for a given workload before the drive reaches its endurance limits. 7 Not available in all countries.